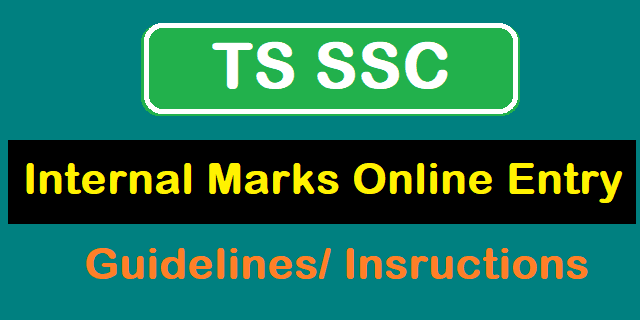 Guidelines/Instructions for TS SSC Internal Marks Online Entry on bse.telangana.gov.in,Instructions/Guidelines for ts ssc internal marks entry online, bsetelngana, sscinternal.bsetelangana.org, ts ssc internal marks online feeding, guidelines, procedure for working out the formative tests fas marks,co-curricular tests,online feeding of internal marks, TS SSC internal marks(FAs) Online entry/ feeding/ uploading at www.bse.telangana.gov.in, Instructions to Telangana HMs for SSC Internal Marks Entry, TS SSC Internal Marks Feeding, TS SSC Internal Marks Entry, Guidelines, Instructions,User Manual, Procedure to Telangana Head Masters for TS SSC Candidates Internal Marks Entry or Online Feeding in the BSETELANGANA.ORG Official Web Portal: www.bse.telangana.gov.in of Board of Secondary Education, Hyderabad. Govt of Telangana, Director of Govt. Examinations, Telangana, Hyderabad. Rc.No.41/J-1/2018.Dated: 12-02-2018. :: Sub:- SSC Public Examinations March 2018 - Feeding of Internal marks - Reg. 1) Visit one or two schools every day and ensure that the schools are entering the internal marks accurately and see the work is completed as: per schedule. 2) Review with the Deputy Educational Officers / Mandal Educational Officers and get their visit reports every day. 3) Arrange trainings for Deputy Educational Officers / Mandal Educational Officers and Headmasters on the subject. 4) Communicate guidelines to all the Schools. 5) Initiate action against the Headmasters/Schools who are found to be negligent of the work. 6) Collect one copy of the internal marks from all the Schools through Deputy Educational Officers / Mandal Educational Officers and arrange to send them to the Office of the Director of Government Examinations on the scheduled date. 7) Submit daily reports to the Commissioner and Director of School Education as well as to the Director of Government Examinations till the work is completed. 8) At any circumstance the feeding of internal marks schedule will not be extended. In this regard. DGE TS once again request the all District Educational Officers to make arrangements for feeding Internal marks pertaining to Regular / Vocational Students appearing for SSC Public Examinations March. 2018 on web portal (www.bse.telangana.gov.in) from 12-02-2018 to 26-02-2018. Encls: Copy of guidelines are given below..
Download the ‘User Manual for Internal Marks Entry’ from “Quick Links”. Read the User Manual thoroughly before proceeding further. Click “Online Application Form” link from “Quick Links”. The Internal Marks Entry Screen look like below. There are 10 studnets per page is displayed. After ‘Edit’, the Screen will look like below for Regular and Vocational Students. The student MNR SlNo and Name and Father Name is displayed in the Editable screen. For OSSC students, the OSSC subjects are displayed. If any subject is ‘Exempted’ for OSSC students, the internal marks for that subject is not enabled to enter marks. For PH students, if there are any subjects are ‘Exempted’, the internal marks for that subjects are not enabled for editing. You can skip those subjects. After ‘Update’ , the marks are placed in respective columns and Total Internal Marks are also displayed. Once Marks are entered the color of the row are changed to light Green color. After ‘Entry’ Student internal marks can be ‘Edit’ by clicking ‘Edit’ button as shown below. After ‘Edit’ button is clicked, the marks are displayed for modifications. Once all the Student’s internal marks entries are completed, the Print out of entered internal marks should be taken for verification. By clicking ‘Print’ button you can take print out of internal marks. If you click ‘Print’ button but internal marks entry is pending, the system will display the below error message. The print screen is shown below. Click ‘Print’ button to take print of internal marks report. After completion of internal marks verification. If you found every thing is correct then click ‘Confirm’ button. After ‘Confirm’ button is clicked, the system will ask for confirmation because once it was confirmed there will be no ‘Edit’ option will be given. After successful confirmation, the success message is displayed. After confirm, take 3 copies of internal marks report and take the signature of the student in 3 sets. You need to keep one copy in School records, one copy to Dy.Education Officer and send 3rd copy to DGE office through DEO. The entire process of posting of Online furnishing of internal marks comes under the purview of Act 25 of 1997. Any negligence while posting of marks, awarding of marks without conducting tests, awarding of marks without valuation, showing wilful bias/favour towards any candidate etc., will attract the penal provisions of Act 25 of 1997 which ranges frompunishment with imprisonment for a term which shall not be less than Five years but which may extend upto 10 years and with a fine which shall not be less than Rupees Ten thousand but which may extend upto Rupees One lakh. 1. The Headmasters shall keep the cumulative records containing the marks of 4 Formative tests of all the subjects of SSC candidates ready by the end of 1st week of February. 2. He has to verify the marks posted in the cumulative record with reference to the subject wise records, and other evaluation material maintained by subject teachers. The Headmasters are required to undertake this exercise after completion of every formative test and ensure that the subject-wise records maintained by the concerned subject teachers are 100% accurate. The teachers shall sign on the subject wise individual records where formative test marks are recorded after completion of every formative test. Similarly the Headmasters concerned also shall authenticate the records by putting their signatures after verification of the records. 3. Similar exercise has to be done by the Headmasters in respect of posting of subject wise marks on the cumulative records. The Headmasters may obtain the signature of individual teachers, if necessary, on the cumulative record also while duly affixing his signature on the record in token of having verified the marks posted on the record. This completes the authentication of records. 4. The Headmasters shall take the subject wise and candidate wise average of the formative test marks thoroughly before posting of marks Online. 5. In case a candidate has taken only three formative tests and absent for 4th formative test, it is the responsibility of the concerned teacher and the Headmaster to conduct the 4th formative test by intimating the same to the candidate. If the candidate fails to turn-up and if the candidate attendance is within the range of condonation, the sum of the marks of 3 formative tests secured by the candidate shall be divided by 4 and the Quotient has to be taken into account. 6. Similarly, the cumulative record meant for Co-curricular areas shall be authenticated and kept ready for Online posting. 1. Once the cumulative records of internal marks as well as Co-curricular areas are ready Online feeding of internal marks shall be taken up as and when the schedule is announced. 2. Before proceeding with the Online work, the Headmasters and his Staff are informed to be thoroughly conversant with the G.O Ms.No.17 dated 14-05-2014 and the G.O.Ms.No.2 dated 26-08-2014. 3. The Headmaster has to take utmost care while feeding the marks in the computer. He shall not entrust this item of work to any other Person but he may take the assistance of others. He has to ensure the marks of one candidate are not posted for another candidate. 4. The internal marks of all subjects of a candidate i.e., both curricular and co-curricular shall be entered in the computer. If any field of any candidate not entered, the computer will not allow you to move further. 5. In case of candidates who are exempted from taking 1 or 2 Languages as per the G.O.Ms.No.33 dated 19-03-2001 (Physically Handicapped candidates) the columns meant for entering internal marks in such cases are already disabled. 6. In case of candidates who are genuinely Physically Handicapped but not shown as Physically Handicapped in the student’s data, in such cases the Headmasters has to enter ‘0’ in the column meant for entering the internal marks of concerned language/languages. But the Headmaster cannot decide himself whether such candidates comes under the purview of G.O or not unless he has already submitted Physically Handicapped certificates issued by the District Medical Board to the O/o the Director of Government Examinations. Otherwise the candidate’s result will be declared as Withheld. 7. After completion of entering of marks, the Headmaster can take printouts in sufficient numbers and handover the printouts to the candidates for their verification and signatures. This helps avoiding the wrong posting of marks, posting of one candidate’s marks for another etc., Then verify the data with reference to the corrections made by thestudents, cumulative records etc., thoroughly with the help of other teachers. Carryout the corrections if any, take the print out and verify it again to ensure 100% accuracy of the data. 8. Once the confirmation is done in the Computer, the editable option will be closed once for all. Now take 3 printouts and authenticate the reports by affixing the Headmaster signature. Take the printouts along with the subject wise as well as cumulative records to the concerned Deputy Educational Officer for further verification and authentication. The Deputy Educational Officers will verify the printouts with reference to the Registers brought by the Headmasters and sign the printouts in token of his verification/authentication. The Headmasters shall have to preserve one copy in their schools as a permanent record for future references and inspections. The other 2 copies will have to be handed over to the Deputy Educational Officer. The Deputy Educational Officers inturn will send one copy of the internal marks of all the Schools of his division to the District Educational Office on the scheduled date while retaining one copy with him. Feeding Internal marks pertaining to Regular candidates appearing for SSC Public Examinations March 2018 on web portal (www.bsetelangana.org) from 12-02-2018 to 26-02-2018. 1.The Deputy Educational Officers shall circulate the guidelines to all the High Schools under his jurisdiction. Organise the trainings to all the Headmasters on the feeding of internal marks in the computer. 2.Visit atleast 2 High Schools, preferably one Government School and one Private school till the entire process is completed in order to ensure that the process of entering the internal marks is transparent and accurate. 3.Initiate disciplinary action against the errant Headmasters who are found to be negligent in attending the work. 4.Constitute sufficient number of verification teams (not less than 5 teams) consisting of efficient Headmasters/Teachers. Train them adequately to inspect/scrutinize the subject wise records, cumulative records and posting of marks in the computer. 5.Verify the printouts of internal marks entered by the Headmasters with reference to School records and ensure the reports are 100% accurate. 6.The Deputy Educational Officers shall have to affix their signatures on the printouts after the verification is completed and handover one copy to the concerned Headmasters while retaining one copy in their offices for future inspection. They have to send one copy of internal marks sheet of all the Schools under his jurisdiction and send to the District Educational Office on the scheduled date. 7.Prepare a schedule allotting the specific number of schools on each day for verification of records so that last day rush can be avoided. Allotting number of schools on each day for verification depends upon the number of schools in the concerned divisions. 8.The Deputy Educational Officers shall monitor the entire work of entering the internal marks on day to day basis by visiting the DGE website and alert the Headmasters who have not started/completed the work. 9.Submit tour diaries/work done statements for the period to the Commissioner and Director of School Education while extending copies to the Director of Government Examinations, Director of SCERT and the DEO concerned. 1.Monitor the work of Online entering of internal marks with Dy.Eos on day to day basis till the work is completed. 2.Visit one or two schools every day and ensure that the schools are entering the internal marks accurately and see the work is completed as per schedule. 3.Review with the Deputy Educational Officers and get their visit reports every day. 4.Arrange trainings for Deputy Educational Officers and Headmasters on the subject. 5.Communicate guidelines to all the Schools. 6.Initiate action against the Headmasters/Schools who are found to be negligent of the work. 7.Collect one copy of the internal marks from all the Schools through Deputy Educational Officers and arrange to send to the Office of the Director of Government Examinations on the scheduled date. 8.Submit daily reports to the Commissioner and Director of School Education as well as to the Director of Government Examinations till the work is completed. 1.Review the progress of the work on day to day basis with the DEOs/Dy.Eos concerned. 2.Visit at least not less than 2 Schools everyday and ensure the accurate entry of internal marks by the Headmasters. 4.Appraise the latest stage of the work to the C&DSE and DGE from time to time. 5.Ensure the divisional level trainings are conducted by the DEOs/Dy.Eos.